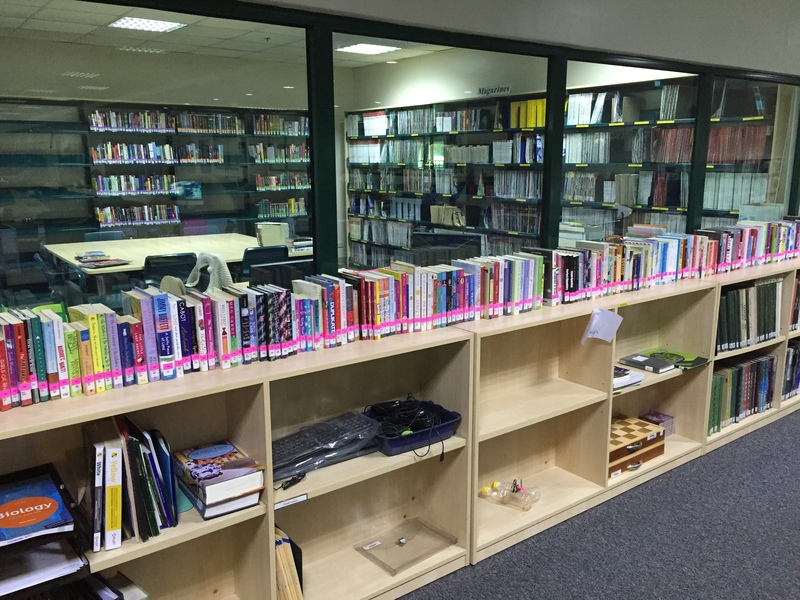 Over the past two years, the high school library has undergone massive transformations: organizationally, physically, technologically, and instructionally. 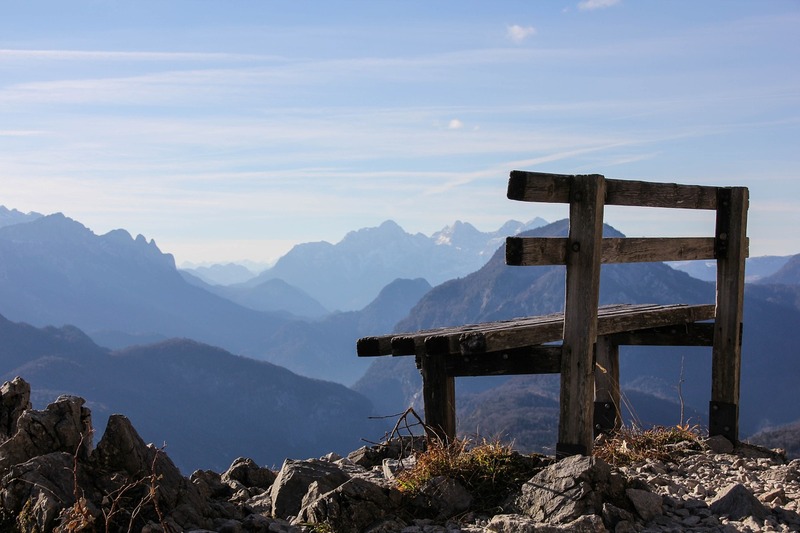 This post will examine the ways that it has changed from an organizational perspective. First, one of the most striking characteristics of this library when I first arrived was how HUGE, bloated, and packed-to-the-gills the collection was. All of our shelving for both Fiction and Non-Fiction is six shelves tall, and every single shelf was packed to the edge with books: approximately 28,000 of them, to be precise. It also felt like a very old collection. If you walked through the stacks to browse, it seemed like a too-large percentage was dated, unattractive, falling apart, etc. Although I would normally advise waiting for a year or so before undertaking a weeding project, the situation was dire. 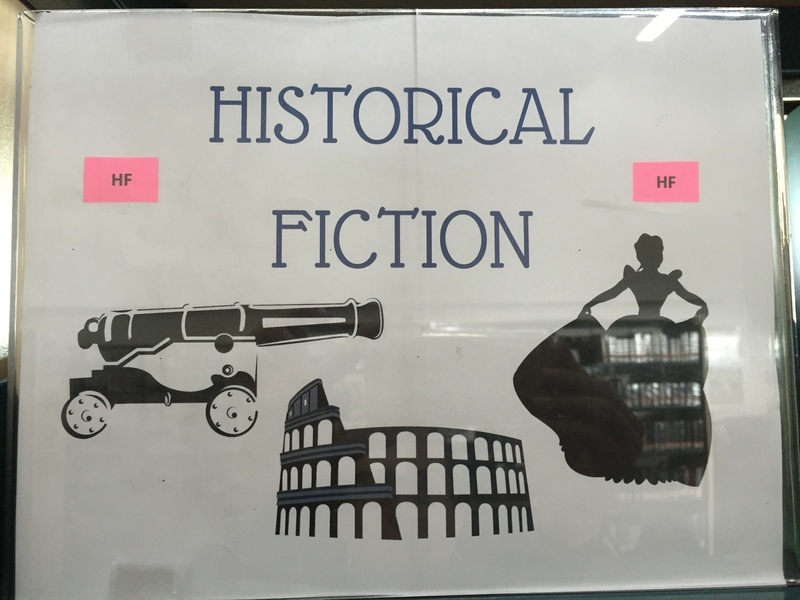 We began with the Non-fiction section and then, when that was completed in about February of my first year, we moved on to the Fiction section. Each time we finished weeding a few hundred books, we advertised them to staff using Smore flyers such as this one and this one. By the time my second year rolled around, it was time to get creative! 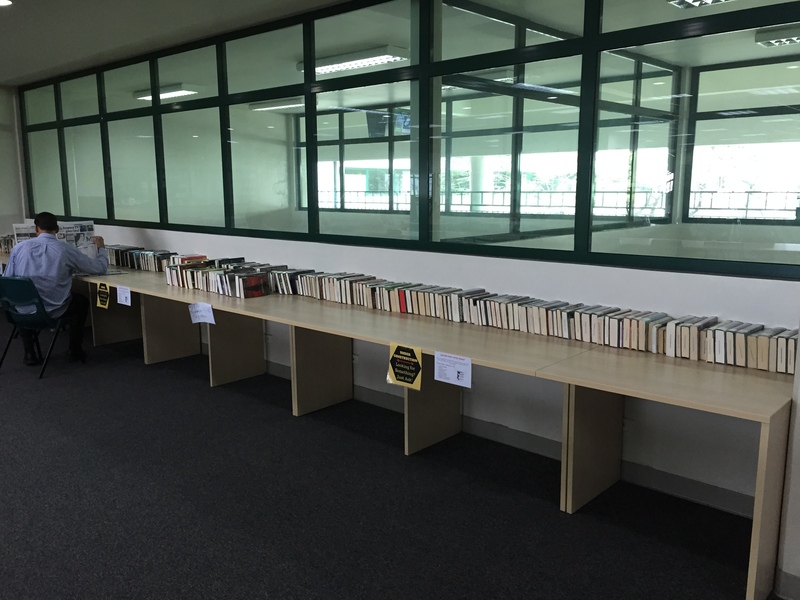 Now that the collection was much more manageable (and after one more round of comprehensive weeding– all told, we weeded approximately 7,600 books between the two years), we decided to turn our attention to the Fiction collection, because that’s where you can really have some fun. 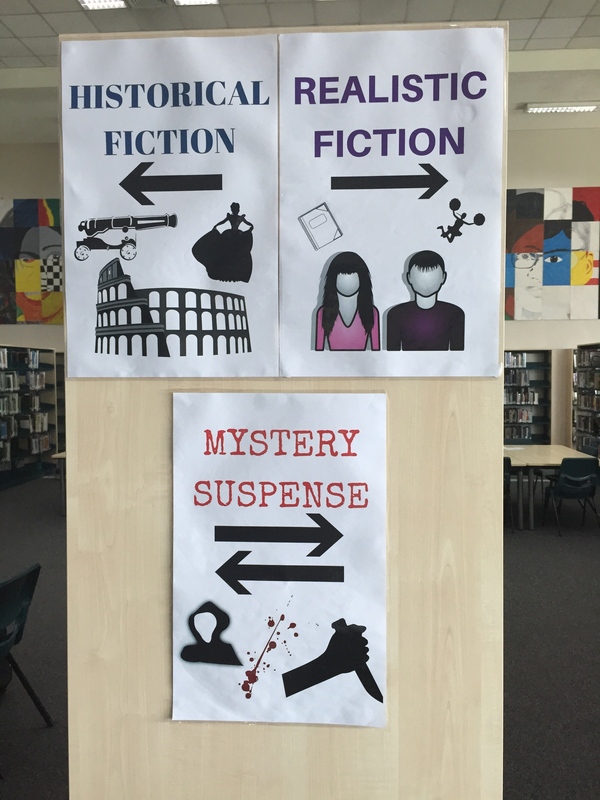 After observing that high school students here were not perusing the Fiction section looking for books, or asking for recommendations, or being required to have books to read for pleasure, and just generally were not engaging with much Fiction, we decided to make it really easy and attractive for them to quickly find books that were right for them. Yes, we decided to GENREFY! 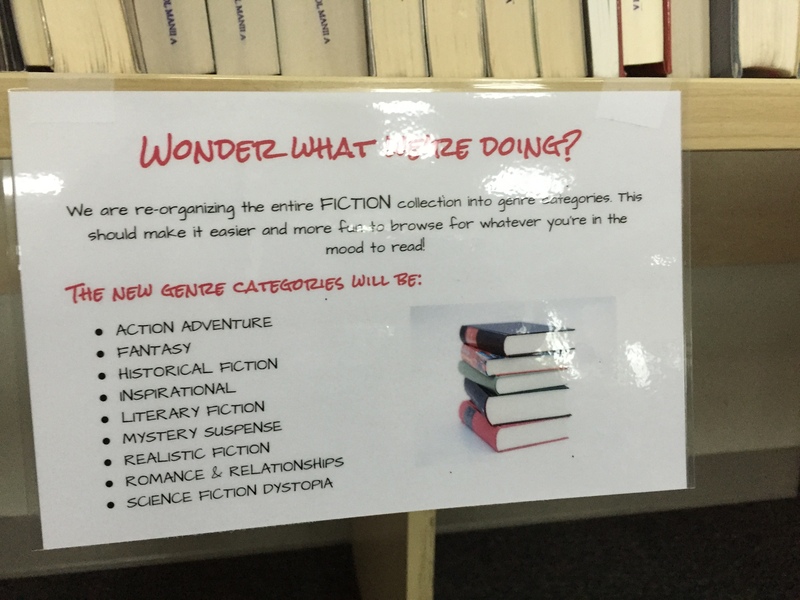 Genrefying as a concept has been around for a while, but I had not felt compelled to explore it at my previous school, as our collection was not very large, and because students were regularly and successfully asking and browsing for books. 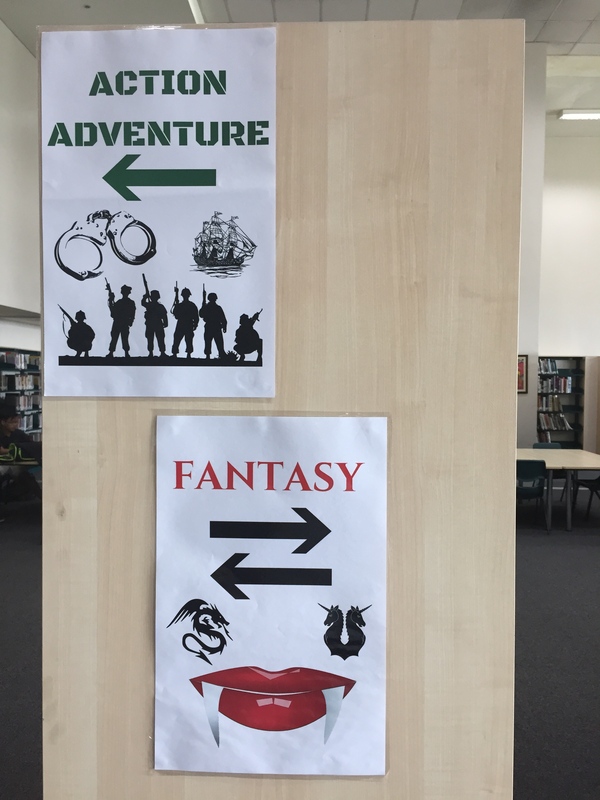 At my current school, however, the question of how to get books into students’ hands has been much more of a challenge. 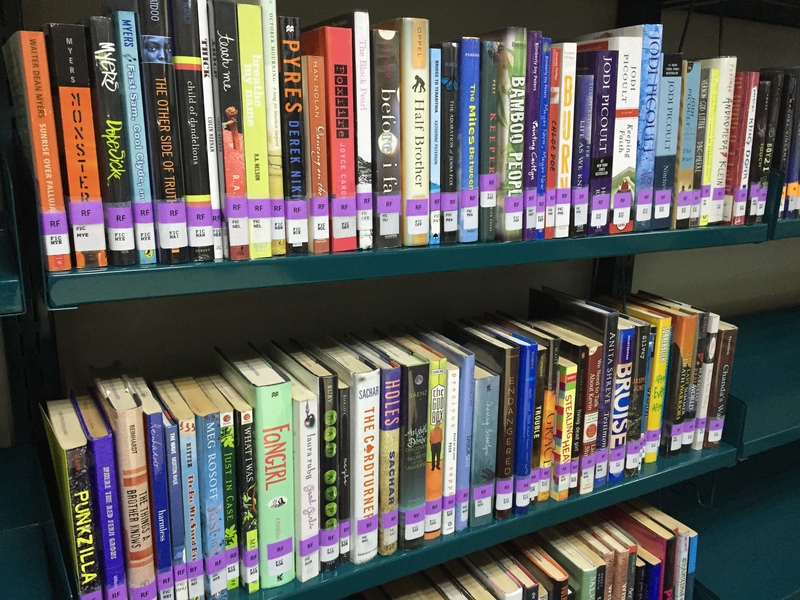 After doing a little online research, I found inspiration and great ideas from The Mighty Little Librarian (@librarian_tiff) and Mrs. ReaderPants (@mrsreaderpants), and decided to embark on a genrefication journey of our own. The rest of this post details the steps we took to complete this project. Step 1. 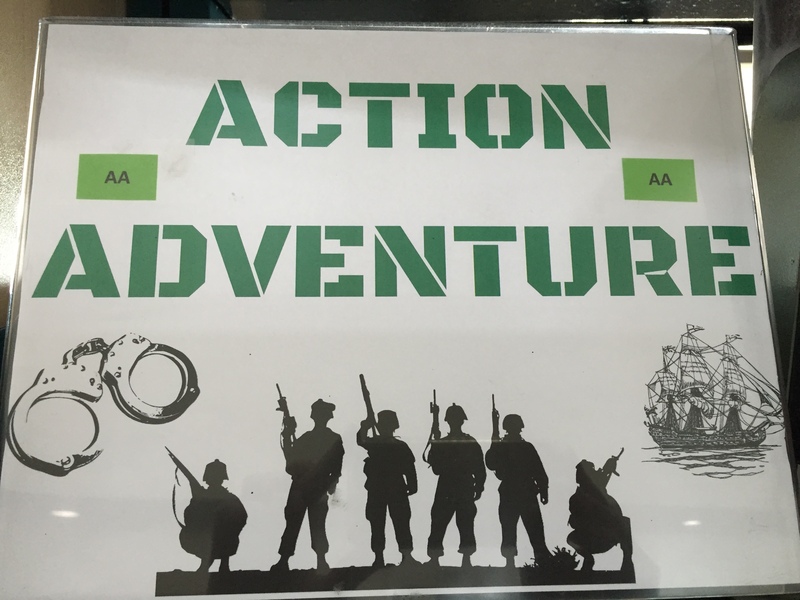 We came up with 10 initial categories for genrefication: Action Adventure; Classics; Fantasy; Historical Fiction; Inspirational; Literary Fiction; Mystery Suspense; Realistic Fiction; Romance & Relationships; Science Fiction Dystopia. We knew that these might change as we went through the collection. Step 2. 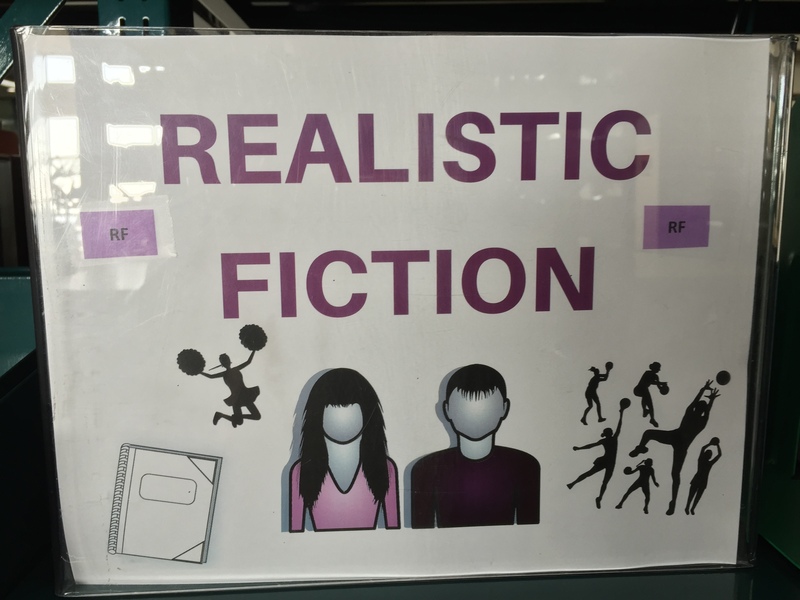 We created 2-letter abbreviations for each genre, which is how they would be initially labeled and then how they would be identified in the catalog. 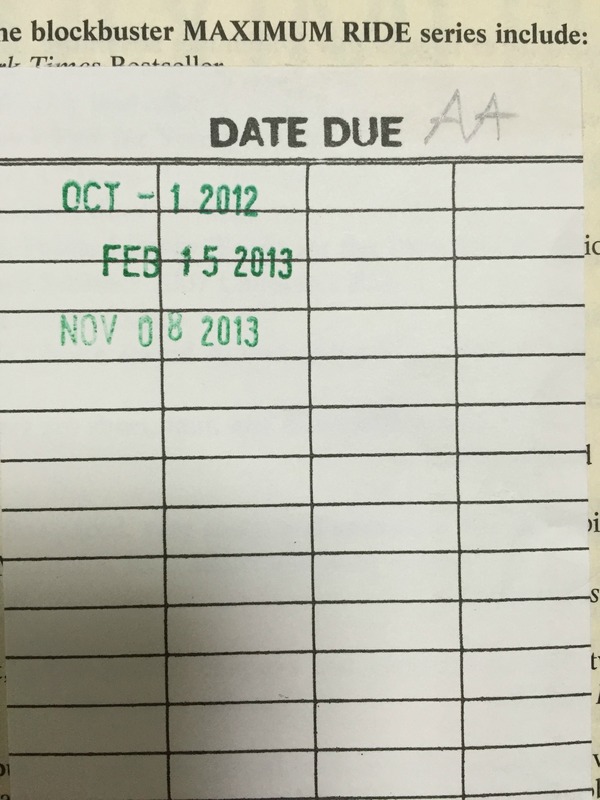 We walked through the entire Fiction collection and made a light pencil mark indicating genre on the Date Due slip of each book. Step 3. 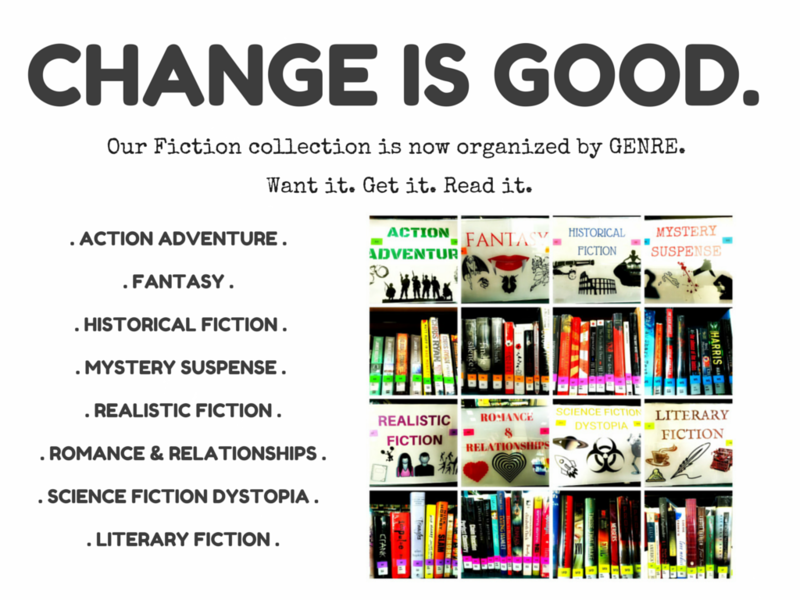 We adjusted the categories according to the needs of the collection. 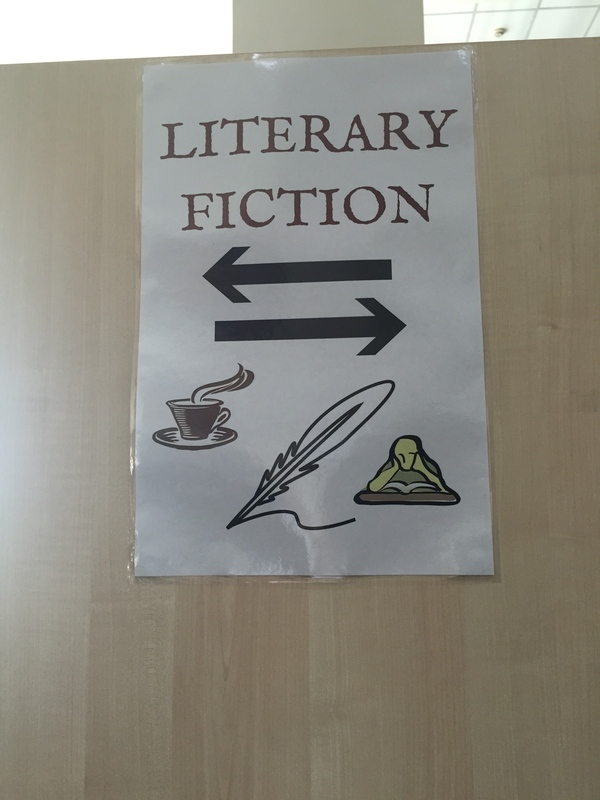 It immediately became too difficult to differentiate between “Classics” and “Literary Fiction”, so we scrapped Classics and kept Literary Fiction. 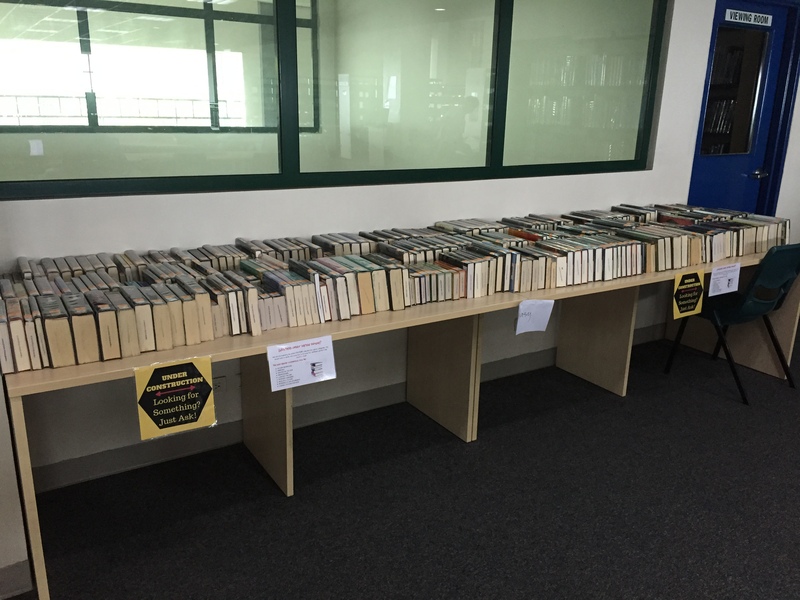 Also, near the end of the initial identification process, we still had only about 15 books in the “Inspirational” category, so we discarded that category and added most of them to Literary Fiction. 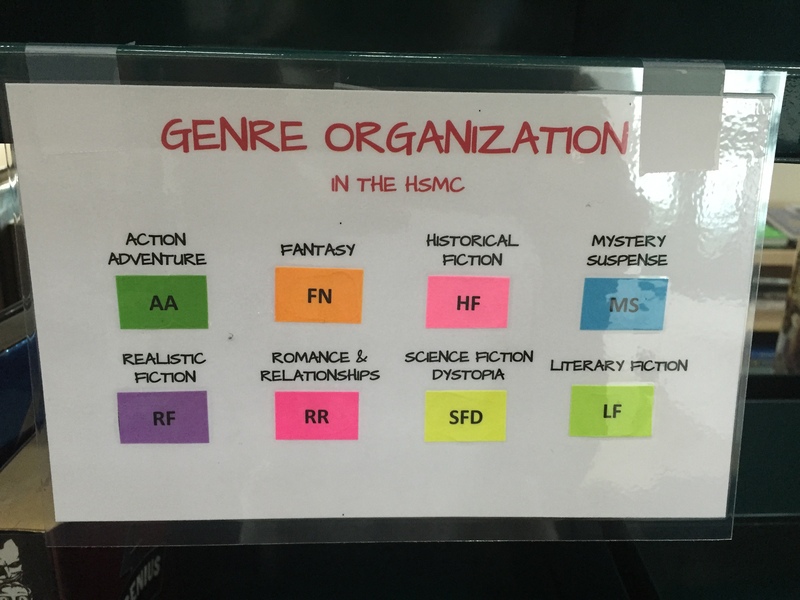 We finished the identification process with a total of 8 genre categories. Step 4. 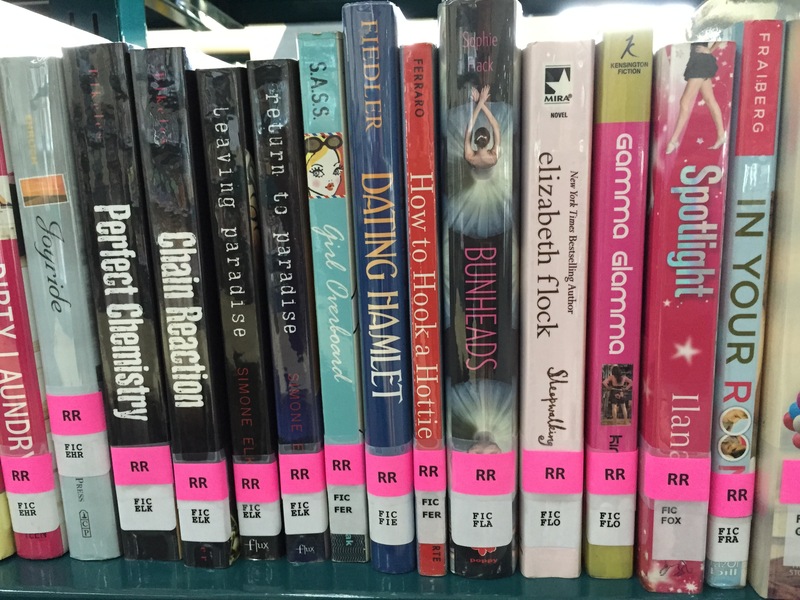 We color-coded each genre and created labels to affix above the call number sticker on each book’s spine. 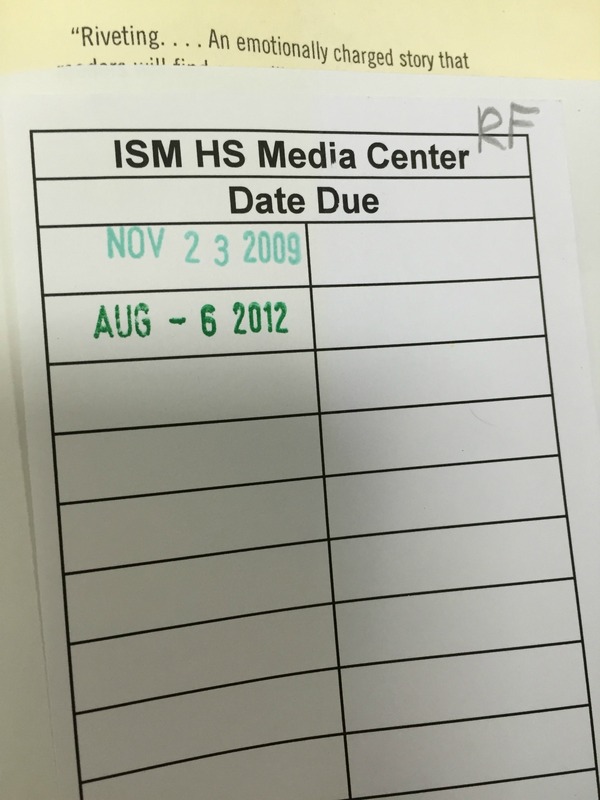 We did this so that we did not have to generate unique new call number labels for every book in the entire Fiction collection. 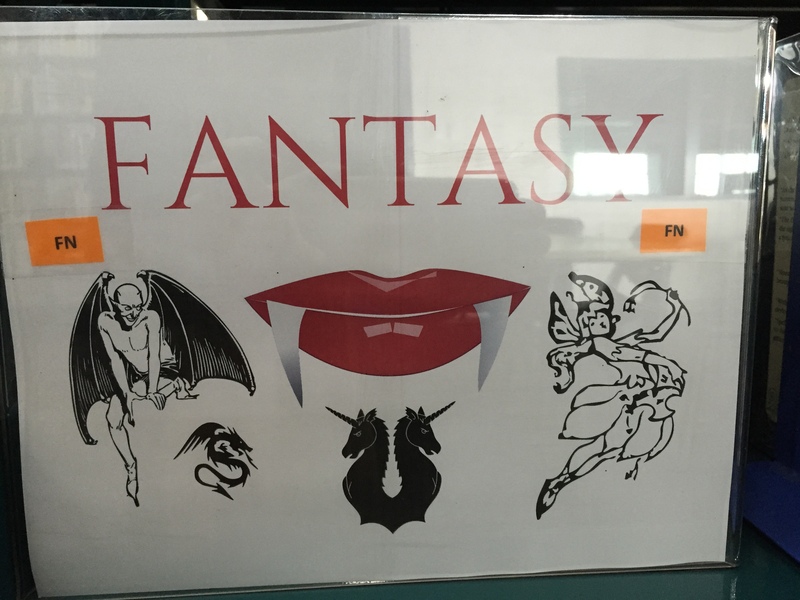 This was suggested by the library assistants and was a BRILLIANT idea that avoided hours of the painstaking work it would have required to generate new unique call number labels, peel off old labels, and affix new labels. Step 5. 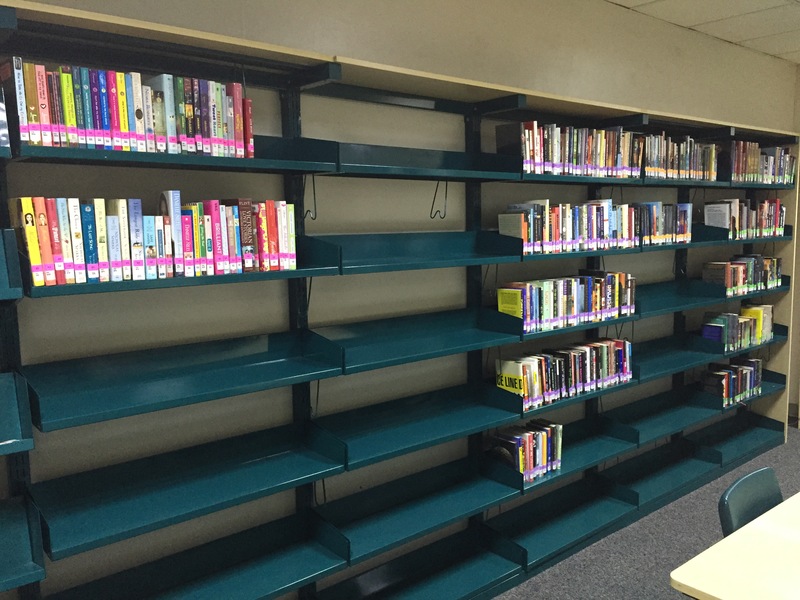 We began to take books off of the shelves and put them onto carts. 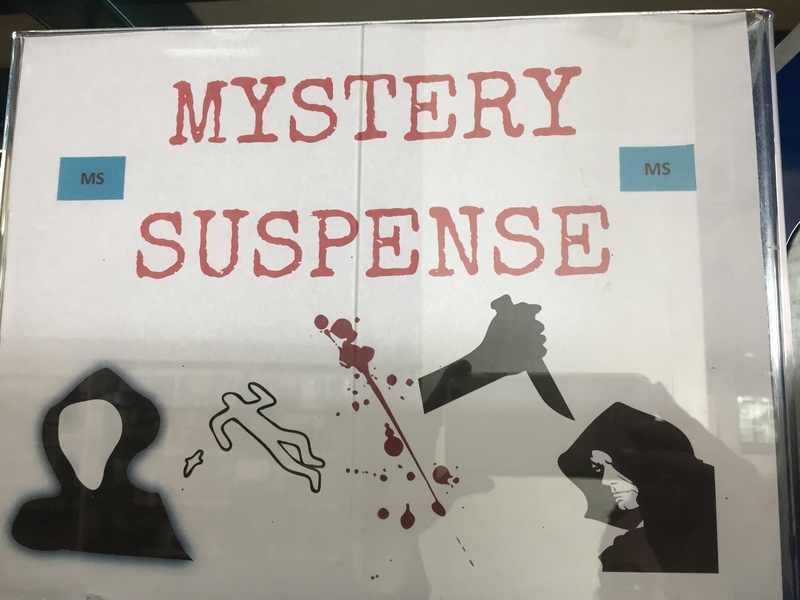 We then affixed the genre labels to each book, according to the genre indicated on its cover page, and then adjusted the catalog record accordingly. Step 6. 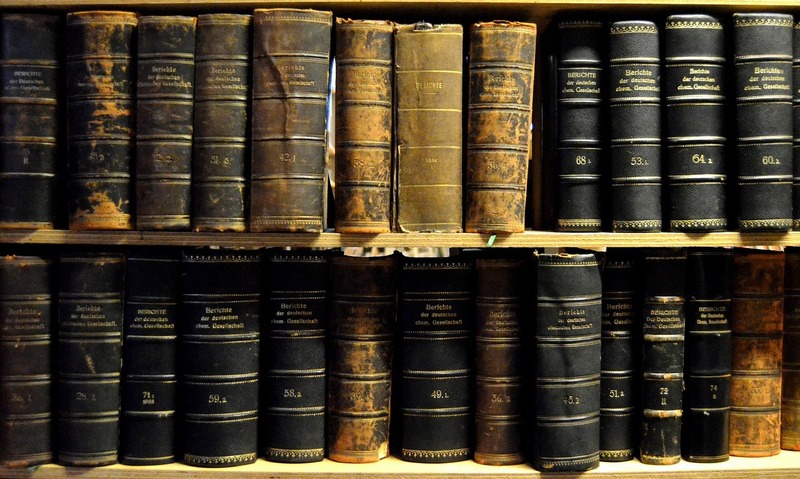 Once books had been labeled and their records had been altered, we began to put them together in various places throughout the library. 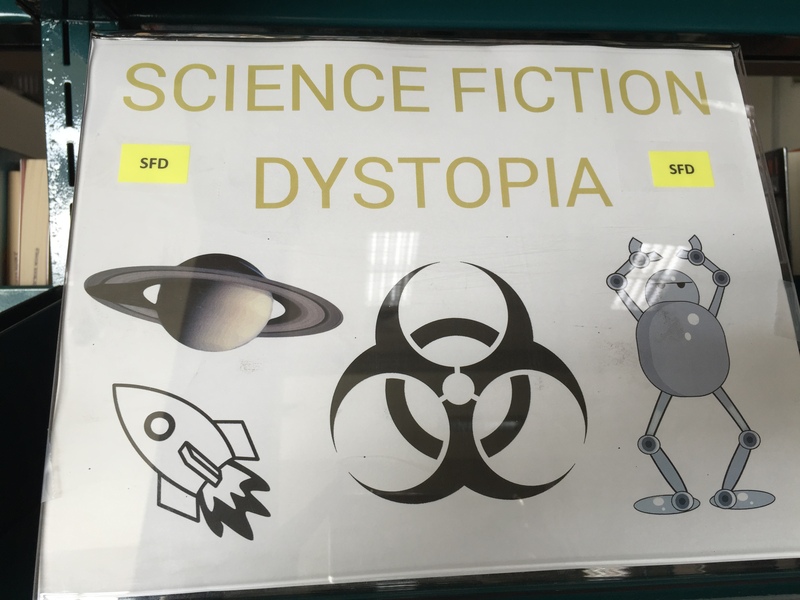 This proved to be a challenge, especially for very large genres like Science Fiction Dystopia and Mystery Suspense, but we felt that it was important to have everything off of the shelves before we began to put them back together with their genres. 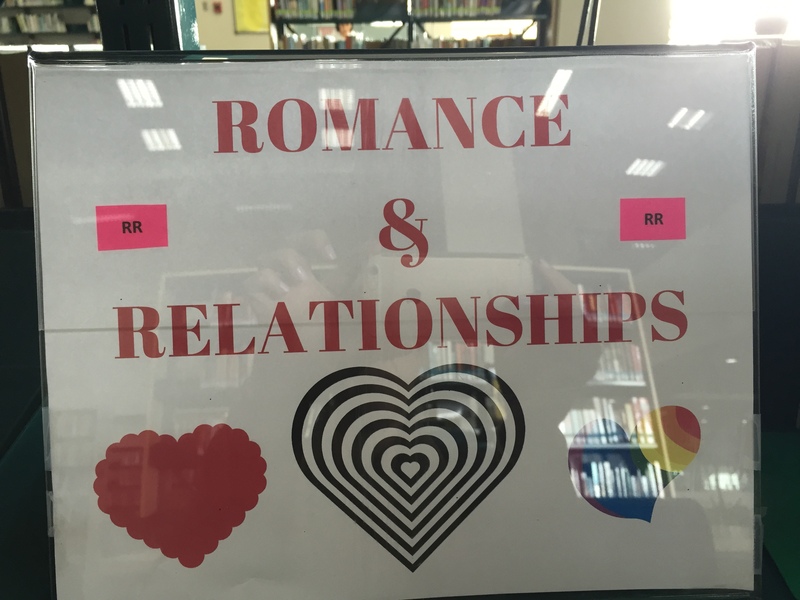 We utilized space in the library workroom, on long tables at the sides of the library, on shelving behind the circulation desk, and on as many carts as we could find. Step 7. 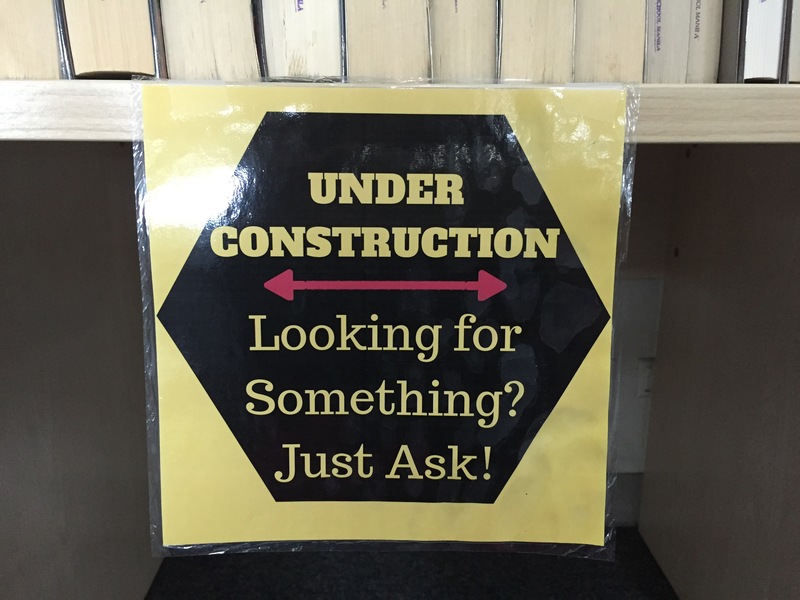 While we were working on this project, the library looked markedly different, so we posted signage on our temporary genre storage locations throughout the library as well as on all of the empty shelving. We wanted people to be able to find what they were looking for! Step 8. 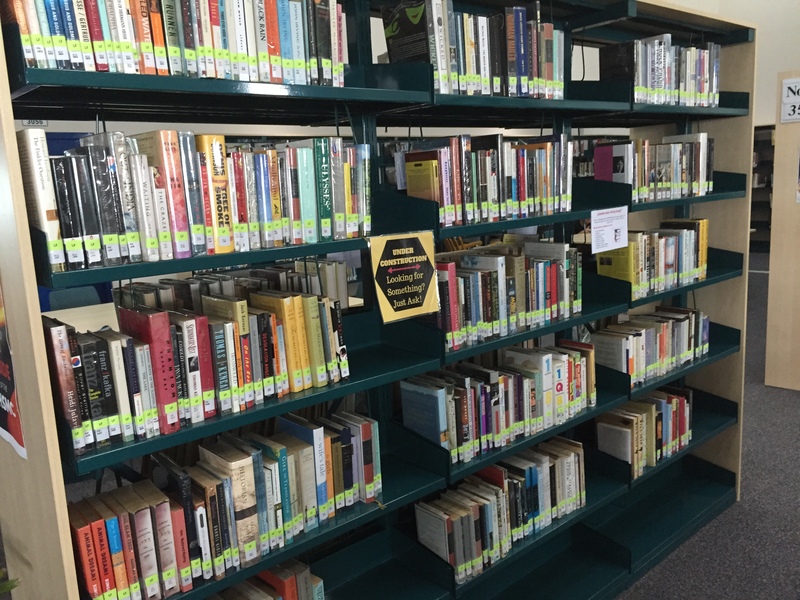 Once the entire Fiction collection had been labeled, re-cataloged, and placed together with their new genre-mates, it was time to re-shelve everything in the new locations. 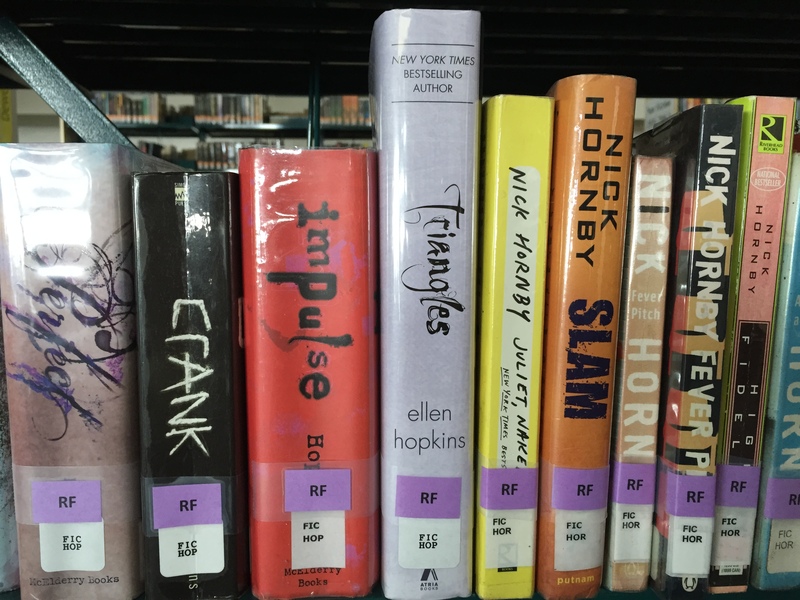 We decided to organize the genre sections alphabetically throughout the library, with the exception of “Literary Fiction”, which we placed at the very end. Step 9. 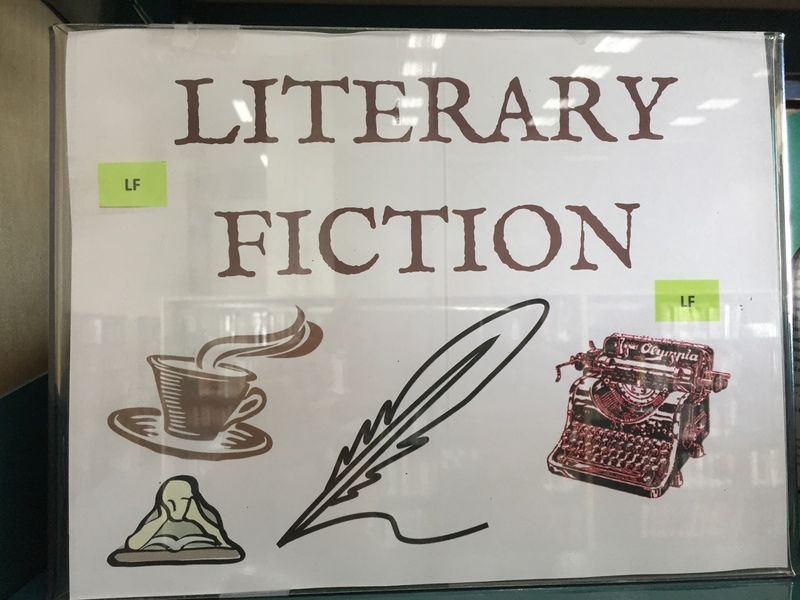 Once the entire Fiction was back on the shelves, organized by genre, it was time to add signage. Step 10. Finally, it was time to advertise! This digital advertisement was posted on the front page of the library website, and was also included on this digital invitation to a faculty wine and cheese gathering hosted by the library. 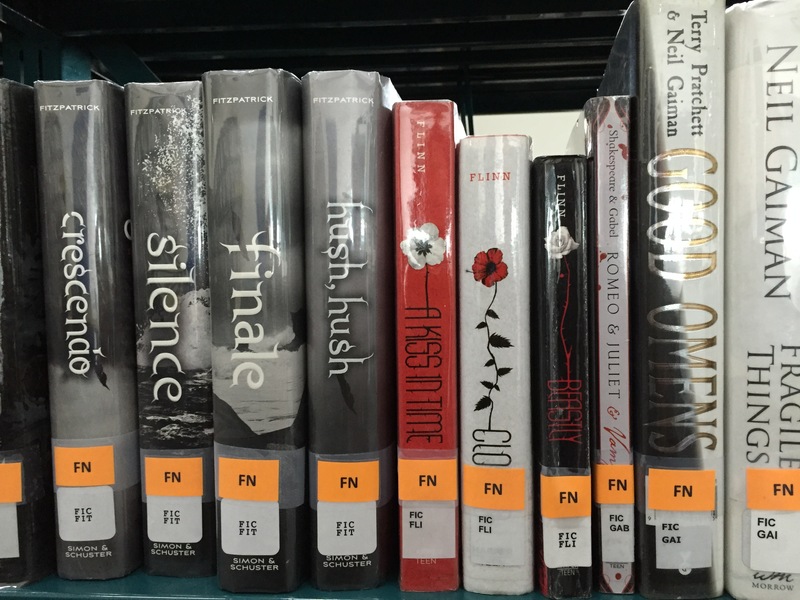 Walking through the library stacks now is a breath of fresh air. Having weeded so aggressively really allowed us to give the collection the breathing room it needed. 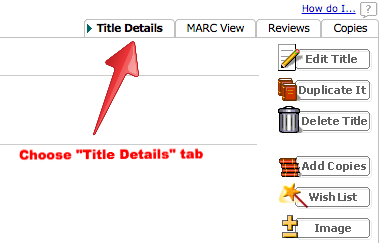 There are now no books on bottom shelves, and the books on each shelf extend only 3/4 of the way, maximum. 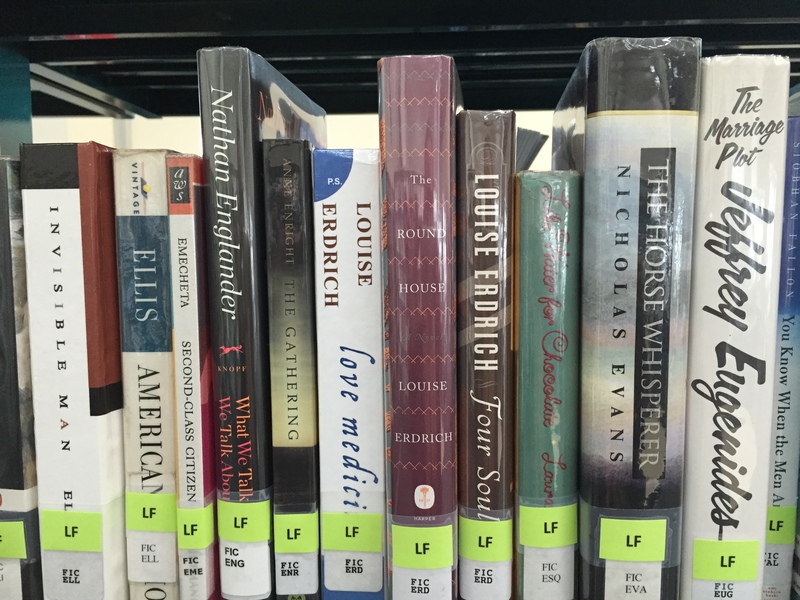 The colorful labels very clearly delineate between sections of books, and the signage is plentiful. 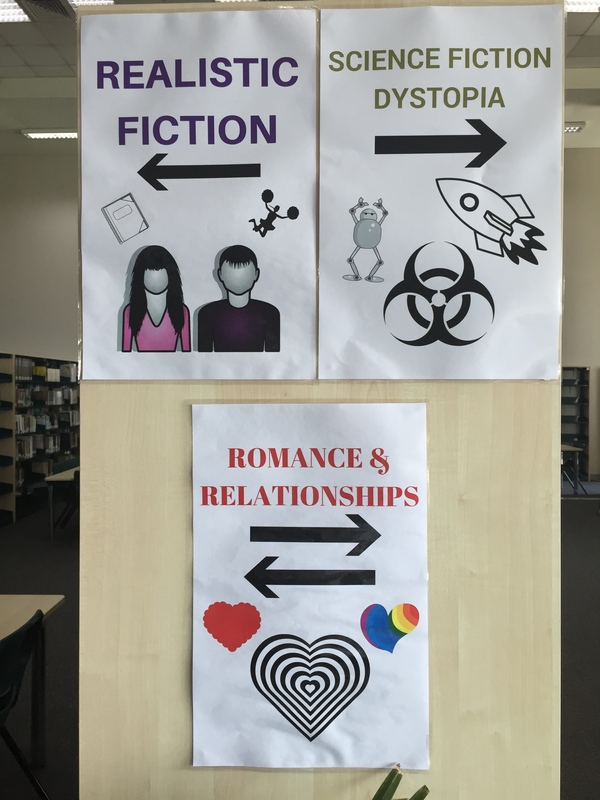 I’m presuming that librarians are the only people who are interested enough in library genrefication to have read this far, so I will tell you guys, if you are thinking about re-genrefying your own library, not to be discouraged if no one is as excited as you are! i mean no disrespect to my awesome and amazing colleagues, but when a well-meaning fellow teacher politely says, “That’s nice” after you enthusiastically describe your big exciting project, it’s a little bit of a bummer. So take ♥! It’s a great change, can be a needed change, and is all about the STUDENTS and ACCESS, which should lie at the heart of any major educational decision. So with that, Go Forth and Genrefy!